Smart TVs: worth the money and hype? What’s the deal with Smart TVs? I ended up with my first SmartTV midway through 2010. A Samsung Series 6 digital LED TV. We’d seen them in an electronics shop earlier in the year in Bangkok, and fell in love with the slim profile of the LED screen. I had no idea what else they had in store. When we moved to the UK, we liked it so much we ended up purchasing a Samsung Series 8 as a replacement. After plugging in and turning on, it became clear the TV had a lot more than a nice screen to offer. 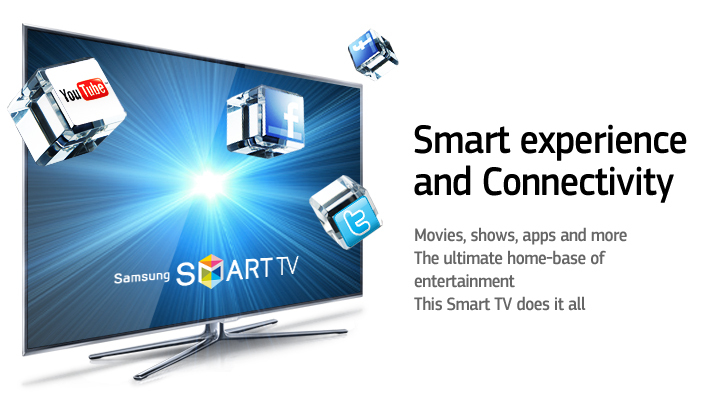 The “Smart” in Smart TVs refers to the apps available, just like apps on your smartphone. Well, not exactly like apps on your smartphone. Your TV is still primarily a TV. Turn it on, it shows you whatever show is on the channel you’re tuned to, or your PVR home screen, or whatever. To access the apps, you need to go into a secondary menu. And a lot of the time, that’s what the apps feel like. Something “secondary,” something that’s a bit of an afterthought. The best apps are, of course, those focused on watching the TV: LoveFiLM, Netflix, BBC iPlayer. There are also a number of sports apps and some fitness apps (for playing workout videos and the like). It gets trickier when you want to get interactive. Facebook and twitter are painful. The time the TV’s processors take to refresh the page, and the time it takes to tap out a message on your remote, make them next to useless. The “browser” is so crippled it’s hardly worth acknowledging, and not actually worth attempting to use, ever. Skype, however, is really nice if you hook up a webcam and microphone. (Samsung and Skype happen to have a co-branded model specifically for the TV. My parents in Canada use theirs to talk to us for our weekly chat.) YouTube is also quite good, but again, typing on your remote gets tedious. There is also a tertiary app menu for playing content on your home network; either streaming music from a networked computer, or playing movies/music from a USB drive you’ve plugged in. So are Smart TVs worth the price? Worth the hype? Yes and no. If you are in the market for a new TV, or really want a nice picture, you’ll likely end up with a Smart TV, as most new units (especially the larger or higher-end sets) have these features. They’re also generally 3D. But if you’re angling for a TV specifically for the apps, and have any other interactive AV components, you could probably stand to wait. Because, frankly, there is nothing this TV can do that a game console (Wii, PS3, XBox), most PVRs, or a Set-top box (Apple TV, Boxee) can’t do. There are even instances where some apps are ONLY available on certain brands (eg. the NHL has an agreement with Sony, so only Sony TVs, BluRay Players, and the Playstation can get the NHLGamecenterLIVE app). A big mistake in my opinion, especially when it’s so obvious with smart phones that apps must be available on all platforms to be successful. Also, 2.5 years on, and two major releases later, the interface hasn’t changed much. It doesn’t demand updates quite as often, and some of the graphics are a bit slicker, but the user experience is basically identical. I’m personally looking forward to a few more years down the road, when SmartTVs have a level of saturation smart phones do, and the manufacturers for the OSs and the appliances start getting really user-centric. Perhaps then we’ll see things like webcams built into the TVs, and the elimination of appliance PVRs in favour of running them as apps on the TV (just a couple things on my personal SmartTV wishlist, after having one for a while). For now? It seems to be a bit of buyer beware, and tempering your expectations. The revolution is coming, but it hasn’t arrived quite yet. Next story Weather apps on Android–a comparison for Oxford!